Erica sends the raft backwards into the rapid; our lean, bronzed tour guide with the easy smile vanishes, the sudden animal ferocity of her stance like a whippet braced to face a lion. She throws her whole body against the rolling water, planting a thonged foot on the steel cross-hatch for leverage, whole leg shaking wildly with the strain, hauling back on the oars, head flipping to watch all sides at once as the raft spins, brown plaits whipping, teeth bared in a grimace. All we can do is hang on and get out the way, bums perched on the forward edge of the cross-hatch, avoiding the planted foot and the hands that punch the hefty wooden oars forward and back a full metre or more each stroke. Our torsos are pressed nearly flat against the walls of icy water that slam over us as Erica heaves us into safety. Erica in a more relaxed moment on a side hike! We poke our heads up, drenched and exhilarated as she guides the raft into calmer territory. White water transforms to a roiling emerald green, thick like churned jelly, bubbles rising through it like it’s just come off the boil. 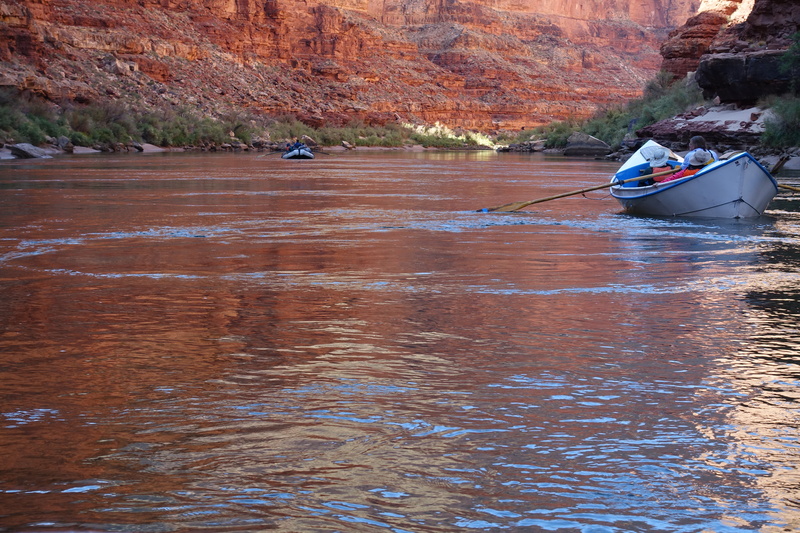 Erica re-emerges as a grinning human, pulling the boat around so we can watch the others come through, one by one. Each is a tense wait followed by high-fives, triumph, each ‘boatman’ yelling from raft to raft to debrief each other on the choices each made under pressure. Hard to get pics of rapids because the camera had to go away usually! But this is a little “riffle”. 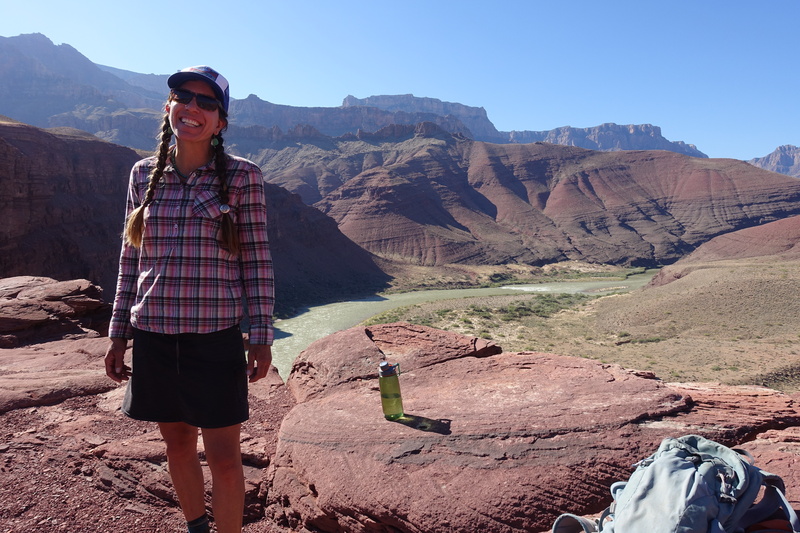 Erica has spent 20 years negotiating the rapids of the Colorado River that runs through the Canyon, and come safely through Hance Rapid, one of the river’s most technically challenging, countless times. But the crew knows better than to underestimate it. Before the ‘run’, they ‘parked’ the rafts at a sandy lip and hiked up the cliff to discuss how it looked today, the order they would go in, approaches they might take. They advised Rachel, who was crewing the supply boat and who would run Hance for the first time. Her jaw set with tension, she quietly accepted all the hints her colleagues gave her and – of course – ran it beautifully. Bill scouts Hance – not the river’s largest rapid, but one of its most technical – with his crew. Not all the rapids are high drama, but each is a thrill-ride, not to mention a glacial head-to-foot drenching. And much of the trip is spent gliding quietly through a calm river so clear you can see a leaf float by ten feet down. Below us it is deep green, but ahead it has infinite colours as the sun and rocks change overhead. The Colorado is mint green at dawn, silver as the rising sun touches it, pink and red as it reflects the two-billion odd years of Earth’s story rising on either side of it. It turns purple as the reds mix with the reflected blue Arizona sky and gleams gold at sundown. At night it turns black and roars. The colours of the Colorado. Above it unfolds a geological history lesson I just don’t think I would have grasped had I looked down from above on just one day. The canyon has stood in its present form for roughly six million years. Each day as we move through it, the walls get higher as a new layer of rock appears, each unique in appearance and origin. The guides are full of knowledge about the landscapes that these rocks rising above us once represented. They know just as much about the present-day ecology, the impact the controversial Glen Canyon Dam has had on the place and its native species. They identify for us the bighorn ewes and rams, desert spiny lizards, does and bucks, scorpions that glow under UV light. Once we even see a beaver, fur glistening with water. And birds! It is migrating season and condors, wrens, ospreys, Canada geese and more soar overhead. The camps we pull up at each afternoon are pristine, respected so utterly that not so much as a peanut or rubber band drops on to the fine sand without being carefully scooped up and locked in the trash to be packed out at the end of the trip. 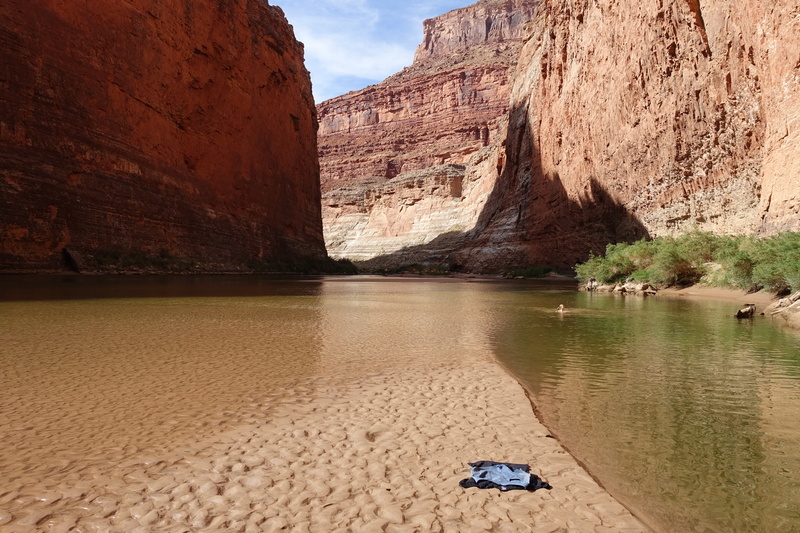 It is carefully managed so that only so many people are permitted to be on it at once, meaning that of the annual six million people who visit the Canyon annually, only about 23,000 of these raft down the river. Our group on a side hike. 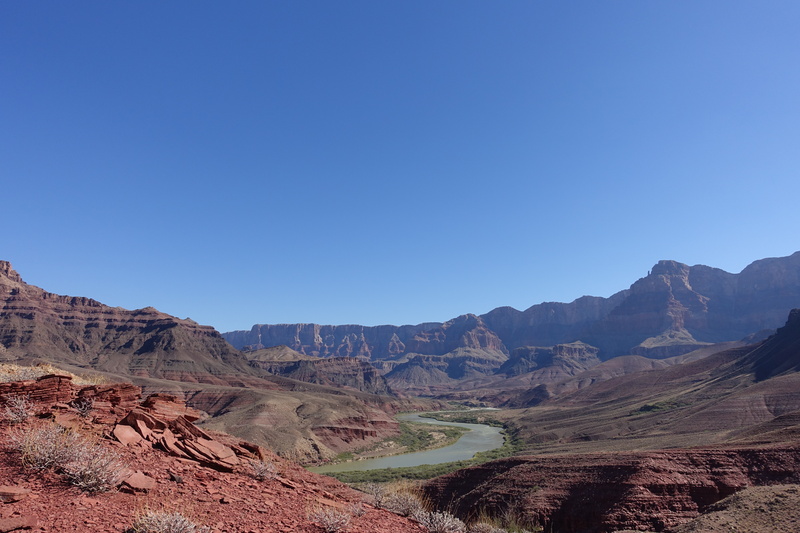 Our six days is a half-length trip, Upper Canyon only – from the start at Lees Ferry, near Glen Canyon Dam, downstream for 88 river miles where we will emerge to hike up and out via Bright Angel Trail. The rest of the bunch will go onwards. They are mostly Americans from all over the states, mostly around late middle age, a fit and outdoorsy bunch, all very friendly and bursting with enthusiasm for the trip. There is one other international couple, a Swedish pair around our age who are also on extended travels. We all get close very quickly. There is something about squatting to pee in the river in front of each other that erases boundaries with lightning efficiency. 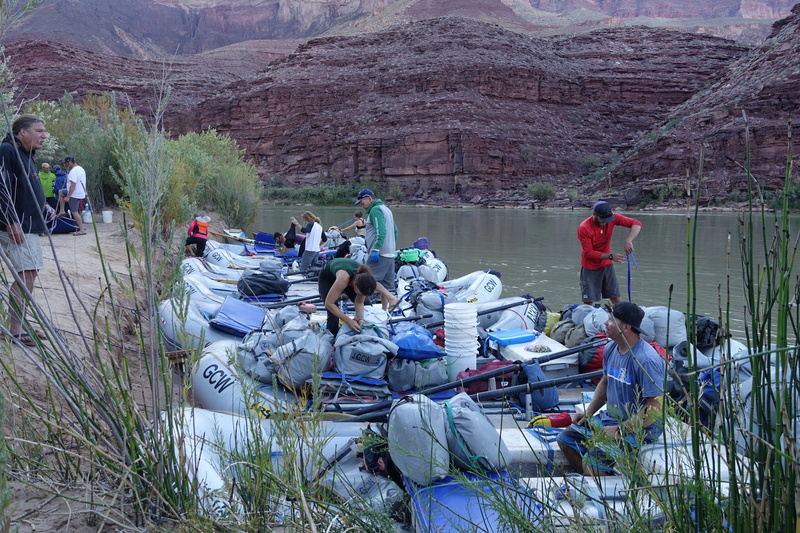 This is Grand Canyon Whitewater’s final trip for the season and we have lucked out. The weather, often extreme in the Canyon, is now a perfect Fall. Nights are a breezy 10 Celsius. Brilliant blue days reach 30-35. Owner Bill is on the trip himself and has invited pretty much his whole staff along for the ride, resulting in a luxurious number of guides for us all – every day Stu and I have a different guide, usually all to ourselves, and regret only that we couldn’t make it on to everyone’s boat in our six days on the water. The boatmen get ready in the morning. Watching them repack the boats is like watching an intricately choreographed dance! The boatmen are happy and relaxed, anticipating winters working on their side businesses or travelling. They all love the job, but it’s undeniably a difficult one, done in an often harsh environment and hard on the body. A 15-minute go at the oars that I was allowed in calm water made me realise rafting is not a craft for the faint-hearted. Meeting them all and hearing their stories was one of the highlights of the trip. They are not just committed environmental advocates. Many have river research backgrounds. Erica is a fine artist, exhibiting regularly. Chelsea, LA-bred, has a background in ballet, acting and music. Brian, with more river trips under his belt than perhaps anyone in history, appeared in Into the Wild and The River Wild (both awesome movies… we have already re-watched The River Wild). Brian shares a vast ecological knowledge from his research background and also owns a ski outfitters’. J-Mo (StuMo’s American equivalent who reminds us strongly of Luke) has built 17 houses in his home town of Flagstaff. Walt is a music expert and owns a Spanish-language and outdoor adventure school in his home, Costa Rica. 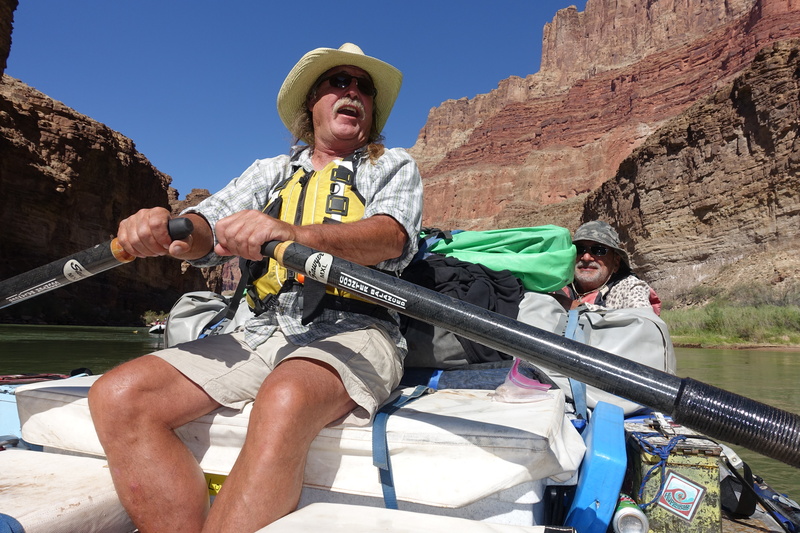 The bunch share decades of experience of the Canyon waters and are prone to throwing concerts of an evening, singing Western classics and new local music, accompanying themselves with guitars, a mandolin and bongo drum – and, of course, a pair of spoons. Sometimes Brian will give us a natural history lecture; other times, a guest will stand up and sing a song or read a poem. We dance on the sand at night under a ripening moon in the shadow of rock walls more vast than we could ever have imagined. It is all touched by magic. On the final night the moon rises full, and we dance a conga line around Brian’s ingenious homemade ‘campfire’. Stu and I don’t really want to leave. All that is luring us out of the Canyon is the promise of more starry skies ahead in the West’s most renowned national parks – Yosemite, Sequoia, Zion, Bryce Canyon, Arches and the Rocky Mountains. We look ahead to these places with renewed vigour, and a renewed sense of all that can be possible in life. But first, we must hike up and out via the Bright Angel Trail. And that is another story. Scorpions glow in black light. Beavers actually make little dams. Did not seem angry tho. No bugs = no tent = sleeping under the stars. Jar + lid with hole + paper towel + lighter fluid = camp fire. Camp toilets are now called “Groovers”. What did Stu get out of the Grand Canyon? Sand. We have to come back for the second half. Who’s in? 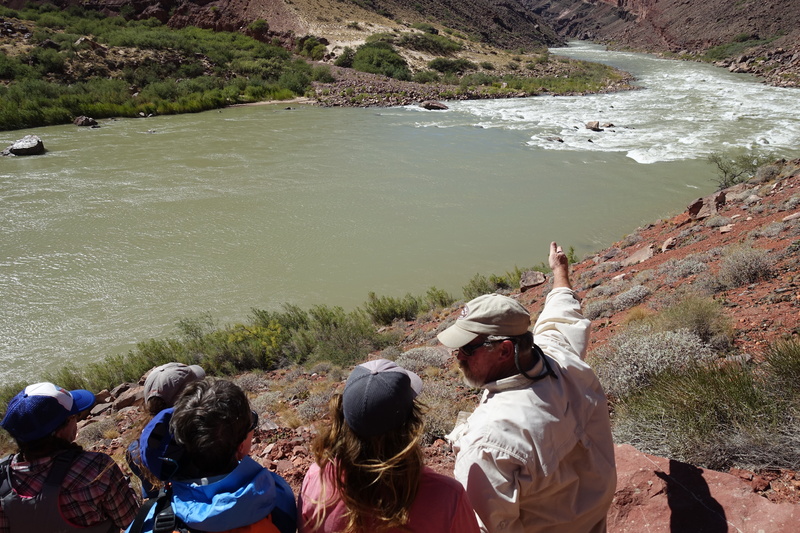 This is where the Little Colorado joins the Colorado. Our campsite on the last night. Bright Angel Shale. Favourite rock layer! Just another jawdropping day on the river. How’s that for pristine water? Taken from one of our lunch spots. Slot canyon, reached via a 1-hour hike. 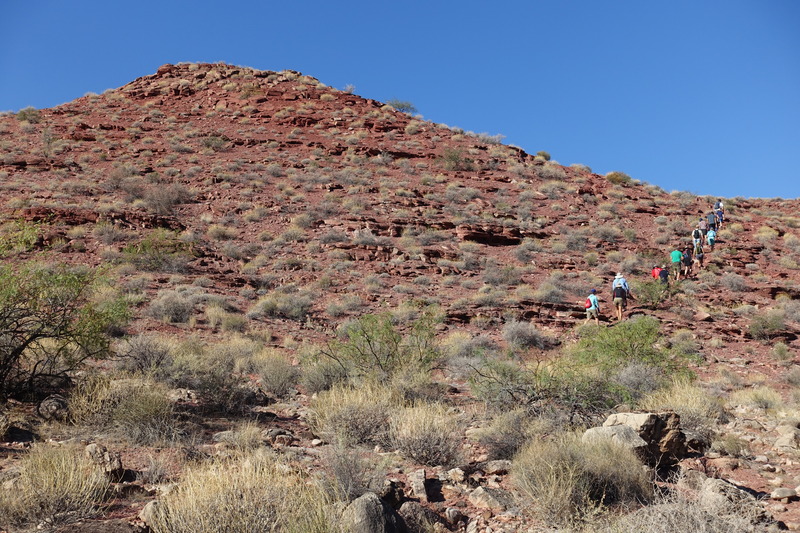 This one (taken by our new mate Pat) is of us walking back from that slot canyon! 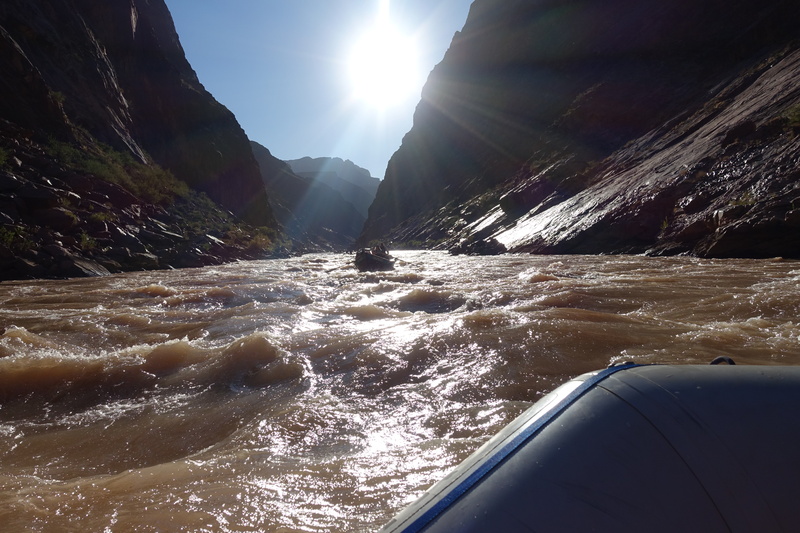 This entry was posted in (Vaguely) Literary Travels and tagged Arizona, Bright Angel Trail, Colorado River, Grand Canyon, Grand Canyon rafting trips, Grand Canyon Whitewater, Upper canyon raft trip, which Grand Canyon rafting company is best, whitewater rafting by Emma Young. Bookmark the permalink. Loved this Emma and your Erica opening was fabulous! I have so enjoyed following your adventures, albeit with more than just a tinge of green clouding my vision. Your posts are always fabulous, but this one is next level! Opening took my breath away. Just beautiful. Argh you guys are all too kind! Thanks so much! It deserved a bit of a special effort we thought! Oh, you guys! Thanks so much, what a beautiful comment. “Seize the day” was something my dad urged us to do before he died and we are trying to do just that, so it’s lovely of you to stay. We are trying to beat the winter through the national parks and are already in Utah (Cedar City tonight, Zion tomorrow) so we really regret not catching up with you again! Especially since that meal sounds so damn good. You have the email now so when you plan your trip to WA we would love to give input and hospitality when you get to Perth! Take care!! Lived the story, love the great writing, really enjoyed meeting you guys and hope you are having a grand time seeing the best West on the planet (okay, so I haven’t been to Perth). Keep on traveling, keep adventuring and keep writing. I’m pretty sure we will all remember this trip for the duration…. Thanks Jane! it was great to meet you too, and now that we have been to Death Valley, Sequoia, Yosemite and Zion we quite agree… this is an incredibly special landscape. Hope to look you up when we one day get to Alaska! Thanks, Rich! We will definitely look you up for “em and stu do America part II”!